Kayakers passed under the Longfellow Bridge as it undergoes a restoration project. Disruptive traffic restrictions on the Longfellow Bridge will be extended by two years until about December 2018 because of complications associated with preserving the historic nature of the century-old structure, according to state transportation officials. Under the new timeline, commuters will have to endure at least two additional years of traffic jams and interruptions of MBTA service on the vital link that connects Cambridge and Boston over the Charles River. The bridge, known for its iconic “salt-and-pepper shaker towers,” has been estimated by the Massachusetts Department of Transportation to carry about 28,000 vehicles and more than 90,000 transit users on the Red Line daily when it is fully open. 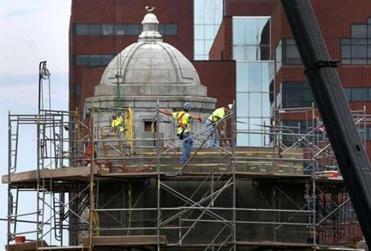 Crews worked on one of the Longfellow Bridge’s towers in May. Michael Verseckes, a spokesman for the Massachusetts Department of Transportation, said that to preserve the venerable span’s original construction, workers must use complex techniques that have fallen out of use. “MassDOT is now working with the contractor to speed up the process to safely repair the historic bridge,” Verseckes said in an e-mail. The delay, which the agency has not yet publicly announced, stretches to five years a project that had been originally estimated at three. Verseckes said the department will soon schedule meetings to notify the public about the new timeline. Workers in 2013 began the project to strengthen and upgrade the steel-and-granite structure, but retain its historical integrity. Currently, only one Boston-bound lane is open on the bridge, which fouls traffic in the bustling sections of Cambridge’s Kendall Square and Boston’s Beacon Hill. When complete, the bridge will have two vehicle lanes into Boston, one into Cambridge, and a bike lane going each direction. The delay could eventually increase the initial $255 million cost estimate to rebuild the span, but MassDOT has yet to estimate any cost overruns. If the costs do rise, officials say they could ask the contractor, JF White-Skanska-Consigli, to foot the bill. The agency has also set aside about $48 million in other costs not included in the bid price. That includes $25.54 million in contingency costs, $7.5 million in police costs, and $15 million in incentives, such as rewarding the contractor for meeting project deadlines. According to MassDOT, workers have had to deal with such historical quirks as lead-filled sand within the foundations of the towers and misaligned arches that have shifted over time. Dennis Banzan, the vice mayor of Cambridge, and state Representatives Timothy J. Toomey Jr. and Jay D. Livingstone learned more about the new timeline during a tour this week. Toomey, a Democrat who also serves as a Cambridge city councilor, and Livingstone, a Boston Democrat, sent a request for a progress update to the MassDOT highway administrator in late March. Toomey said he is frustrated by the delays, but acknowledged the project needs to be done the right way. 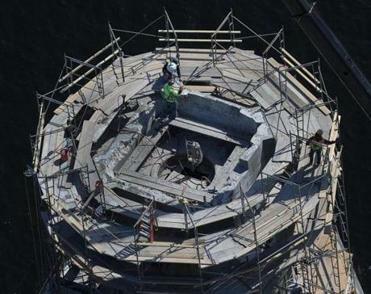 Crews worked on one of the bridge’s salt-and-pepper shaker towers” in March 2014. Livingstone also expressed disappointment. “It’s certainly an inconvenience for the drivers going from Boston to Cambridge, but it’s something that people have adjusted to the best that they can,” he said. One of the conditions of the contract was that workers would ensure that the bridge, which was built in the early 1900s, would retain its historical character. Charles Sullivan, the executive director of the Cambridge Historical Commission, said he was not surprised by delays. “It’s a very, very complicated process and project that involves a lot of technology that is not current in the building trades today,” Sullivan said. For example, the bridge was constructed using rivets, a technique that was eventually replaced by bolting and welding. The laborious process includes heating the rivets to 2,000 degrees, then jamming them into a hole before they cool. MassDOT began the task of removing and rebuilding the towers in 2014. Each 58-foot tower has 515 granite stones of various sizes and weighing up to 3 tons each. State officials say they will work to get the project completed sooner than December 2018. They also note the project could have taken even longer, but MassDOT and the contractor worked to reduce the timeline. Additional work that will continue until August 2019 will not affect traffic. The state last completed a major rehabilitation project on the bridge in 1959. 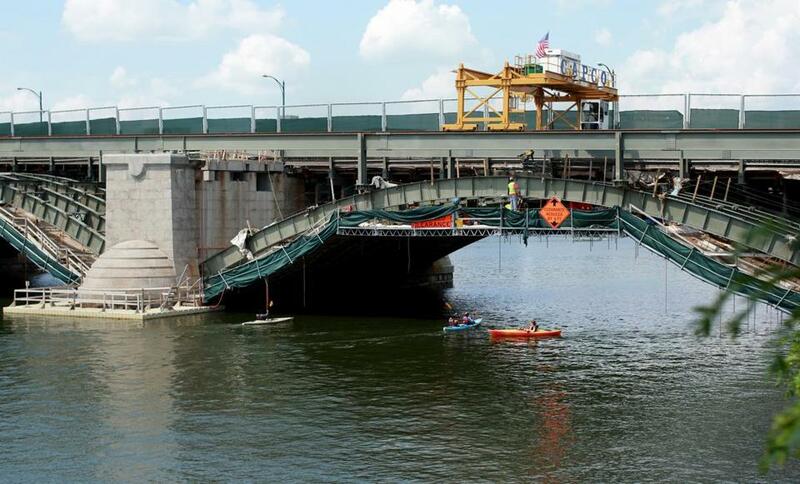 According to MassDOT, inspections in 2007 and 2008 confirmed that the bridge had “significant deterioration.” The state completed a number of interim repairs to help increase its life span before commissioning the current project.